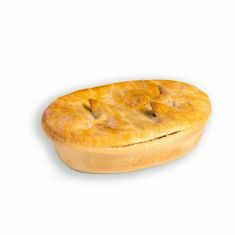 All our pies are made from the finest ingredients, what makes them Australian? No peas and carrots, lots of meat inside a rich tasty gravy that doesn’t run. Flaky puff pastry on the top and a subtle short crust on the bottom, allowing you to hold the pie in one hand and eat on the go! Tender cubes of steak engulfed in our rich tasty gravy, sealed within an appetite inducing golden flaky pastry. Simply throw a layer of chunky diced mushrooms over the Steak & Gravy and the result is Real Deal steak & mushroom pies. A generous portion of medium age cheddar cheese amongst succulent steak and gravy. Chunky pieces of bacon and rivers of cheddar cheese found amongst steak and gravy, it’s not hard to believe that this is one of our most popular pies. An original recipe only found here at Real Deal Pies is our winter warming steak, cheese and chili flakes, a delicious blend of chili flakes and medium age cheddar cheese to compliment the steak and gravy. Tender cubes of steak and gravy, mildly spiced with ground black peppercorns. Succulent steak and rich gravy blended with mild curry powder. A perfect combination of chicken thigh pieces surrounded by our tasty chicken curry gravy. Combine our rich tasty gravy with some lean ground beef for the Real Deal beef & gravy pie. The steak & gravy foundation topped with tender pieces of beef kidney.